Bryce Canyon National Park is a perfect ½ day or full-day excursion for a visitor to Zion Ponderosa and is just 75 minutes drive from our ranch resort. General Information: Bryce Canyon National Park is 20 miles in length (running north to south) and is part of what is known as the Paunsaugunt Plateau (part of the Grand Staircase). At the entrance (north end) of the park the elevation of the plateau is approximately 8,000 feet, while at the southern end of the park the elevation is over 9,000 feet. The lowest elevations of the park (lower edges of amphitheaters) hover near the 6,500 foot range. Bryce Geology: Bryce Canyon is actually a series of amphitheaters (bowl shaped canyons) that rest on the eastern side of the Paunsaugunt Plateau. The sedimentary layer on this plateau is limestone that has been colored various reddish hues by the oxidization of iron. Erosion takes place as water enters the cracks in the stone and then is frozen. The expansion of the frozen water forces the cracks to enlarge, eventually breaking off chunks of limestone. The present formations in Bryce Canyon, called hoodoos, are the remains of the erosion to this point. Each day there is evidence of new erosion and the formations within the park continue to slowly change. 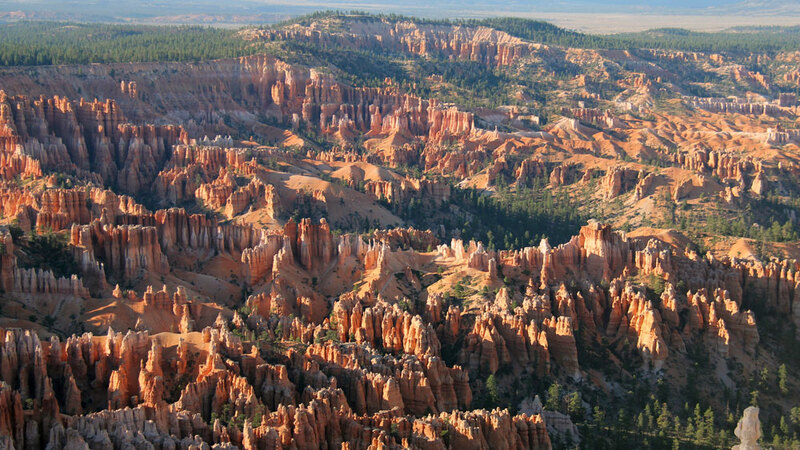 History: Bryce Canyon is named for Ebenezer Bryce, an early pioneer to the Paria Valley. In the 1870’s Mr. Bryce had settled in this valley, to the east of the park, and one day lost some of his cattle. Completely unaware of the magnificent formations, he wandered into the canyons to locate his cattle. His historic comment after retrieving them was, “It’s one hell of a place to lose a cow.” In 1924 the park was designated a U.S. National Monument and then became a National Park in 1928. Bryce National Park is just 75 minutes from Zion Ponderosa Ranch Resort. 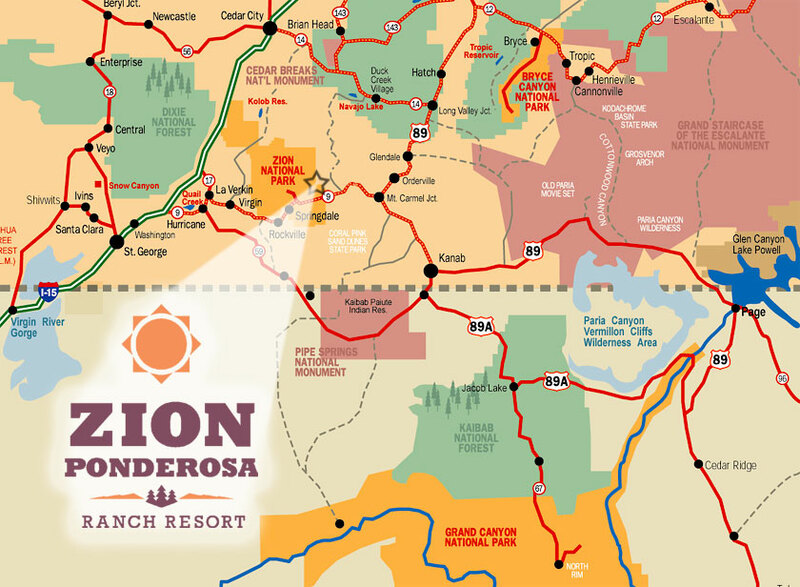 For those looking to knock out two national parks in one trip, check out Bryce Canyon lodging at Zion Ponderosa. Note: Check for more information and travel itineraries to Bryce Canyon National Park at the front desk of Zion Ponderosa Ranch Resort.